The mobile penetration rate in Chile (125%) is one of the highest in Latin America. This opens up wide opportunities for those who are planning to invest in the GSM termination business. Due to the developed tourism and high migration growth of the population, large amounts of international voice traffic are concentrated in the country. Although the average rate is low ($ 0.15- $ 0.03 per minute of conversation) in Chile, the terminator has the opportunity to make good money in this country. Traffic providers offer up to 450 thousand minutes for termination in this direction. Impressive volumes of international traffic are generated by immigrants and tourists. Most foreigners arrive in Chile from neighboring states (Argentina, Peru) to reside permanently in the country as there are a relatively stable political situation and an increase in the economy. In 2016, the migration increase of the population amounted to 41.5 thousand people. Over the past decades, tourism has been actively developing here, and about 2 million foreigners from other Latin American countries, the USA, Europe, and China visit Chile every year. In the mobile sector, there are two leaders who compete with each other: Entel and Movistar. The subscriber base of Entel has more than 9.8 million users, and about 9.1 million people use Movistar. In the Chilean market, there are other two major GSM operators: Claro and WOM. Another 3% of the mobile sector belong to small MVNO (virtual cellular operators). The largest of them are Virgin Mobile, Movil Falabella, and VTR Movil. Due to the high competition, in recent years the tariffs for services in Chile have significantly decreased. In Chile, you can buy prepaid SIM-cards in supermarkets and kiosks, as well as from street vendors. The cost of the SIM card ranges from $1.5 to $15, with the original credit on the account. The standard tariff for local calls is about $0.1 per minute but you can connect unlimited tariff plans to make calls for $0.005- $0.02 per minute. Operators offer profitable bonuses for topping up. 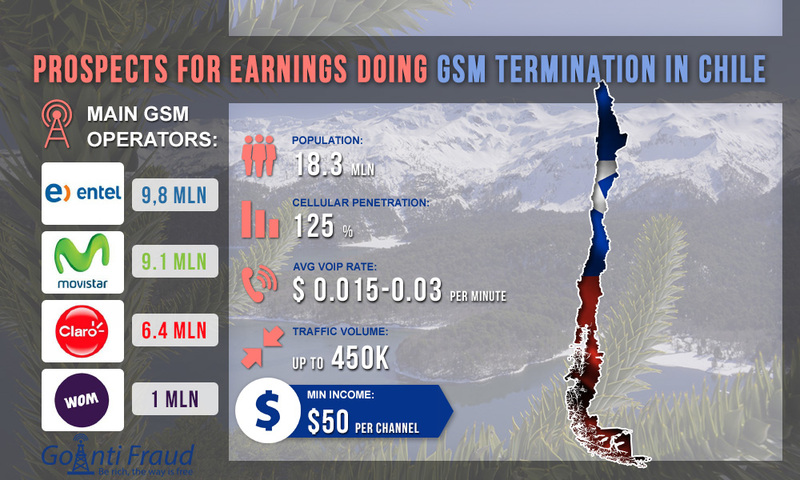 If you install a GSM gateway for PBX in Chile, your minimum earnings will be $50 from 1 channel. For stable profit making, it is important to reduce business expenses on the purchase of new SIM-cards and make sure that you can efficiently bypass AntiFraud-systems.